The big news for this week is that I signed Wyoming’s completed state plan as required under the Every Student Succeeds Act (ESSA). This signifies the official end to No Child Left Behind. The shift from compliance and success for some students (NCLB) to responsibility and success for all students through a well-rounded education (ESSA) will not happen overnight. Through the development of this stakeholder-driven plan, we examined our strengths and weaknesses and are on a path to better prepare students for school and post-secondary success. Wyoming’s plan is submitted well ahead of the September 18 deadline because it’s important that Wyoming educators begin the 2017-18 school year with a clear path forward under the new law. As has been our practice, we will continue to update you as we learn information about ESSA and the approval of our plan. 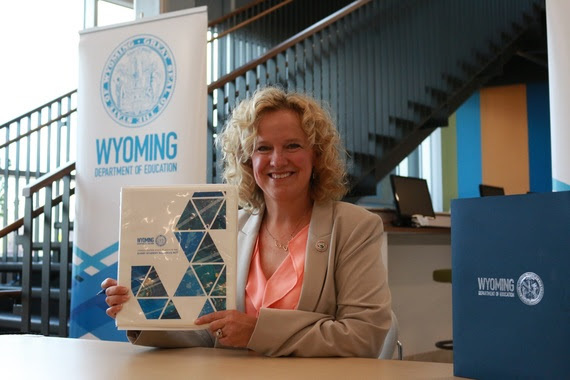 Superintendent Balow holds Wyoming’s signed ESSA plan. Best to all as you begin your new school year AND take part in the great eclipse!